Originally designed as a luxury apartment building over 100 years ago, The Churchill promised “every convenience of a modern hotel with the restful quietude and exclusiveness of a private residence.” Today, The Churchill is completing a guestroom and guest corridor renovation in 2016, adding to the historic charm of the building with brand new guestrooms, baths, and furnishings. Guests and temporary residents have included diplomats, dignitaries, politicians, business travelers, and prominent families. Visitors are attracted by The Churchill’s location on Embassy Row and its proximity to popular Dupont Circle and Adams Morgan dining and cultural attractions. Not only is the hotel rich in heritage, but the Dupont Circle neighborhood itself is listed in the National Register of Historical Places. No matter how guests wish to spend their downtime, they will find a restaurant, café, or club nearby at which to relax or let loose. 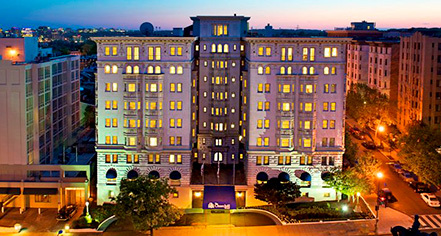 Convenient to three airports and blocks away from the Dupont Circle Metro, it’s easy to get to The Churchill. The Churchill offers every modern luxury combined with historic ambiance, including an upscale dining establishment, business center, and fitness room. The richly appointed guestrooms are all equipped with WiFi. The welcoming multilingual staff will make your stay truly memorable. The Churchill, a member of Historic Hotels Worldwide since 2009, dates back to 1906. The Churchill Apartments boasted "every convenience of a modern hotel with the restful quietude and exclusiveness of a private residence." Cancellation Policy: 24 hours prior to arrival to avoid 1 night penatly plus tax. Cribs and Pack-in-Plays: Available upon request; complimentary. 1 allowed per room. Hotel/Resort Fees & Taxes: Taxes: 14.5%. Occupancy Restrictions: Junior Double Bed Suites (4), Junior King Suites (3), Deluxe King Bed Suites (4), Standard King Bed Rooms (3). Pet Policy: Service animals allowed: Yes. Please tell hotel at time of booking. Pets allowed: No. Rollaways: Available upon request; complimentary. One allowed per room. Originally designed as a luxury apartment building over 100 years ago, The Churchill promised “every convenience of a modern hotel with the restful quietude and exclusiveness of a private residence. Learn more about the History of The Churchill .